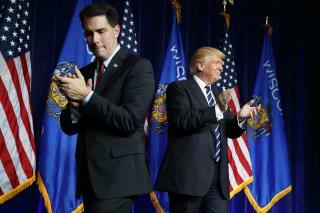 Speaking at a rally in Wisconsin Tuesday night, Trump urged early Clinton voters in the state with "buyer's remorse" to change their votes to Trump before it's too late. He urged Clinton voters in Michigan, Pennsylvania, and Minnesota, which also allow vote changes, to do the same. Fox News explains how the vote-changing works in those four states. The Washington Post reports that the Crusader, the KKK's main publication, offered a glowing endorsement of Trump's message. The Trump campaign forcefully rejected it. "This publication is repulsive and their views do not represent the tens of millions of Americans who are uniting behind our campaign," the campaign said in a statement Tuesday night. The New York Times reports that in a worrying development for the Clinton campaign, early turnout among black voters is down significantly from 2012. In crucial swing state North Carolina, black turnout is down around 16%—and white turnout is up by almost the same amount. President Obama will appear at a rally in North Carolina Wednesday to try to boost turnout, the AP reports. The Clinton campaign says singer James Taylor will also appear at the Chapel Hill rally. The Hill reports that in more promising news for Clinton, a poll released Tuesday puts her support at 28% among Republican early voters in Florida, and 55% among early voters in general. Politico reports that Texas Land Commissioner George P. Bush told a rally Tuesday night that his uncle, George W. Bush, was likely to vote for Clinton—and his grandfather, George HW Bush, was likely to do the same. He may win the election but it will not make any good for the problem of black America. it will be business as usual for him and his all white admimistratiom.